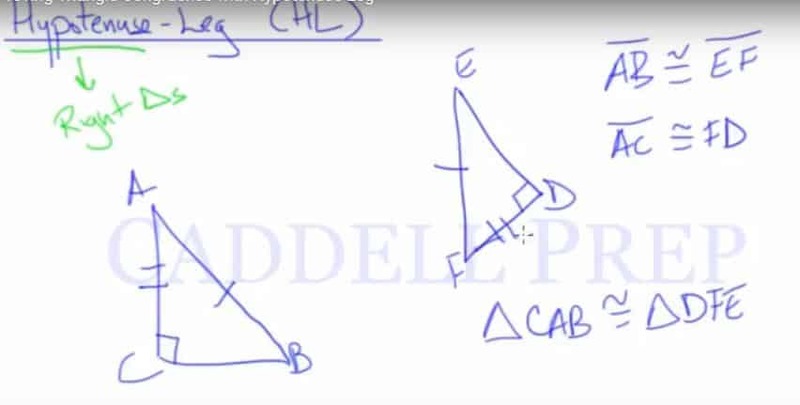 Another way of proving triangles are congruent is using hypotenuse-leg (HL). The hypotenuse is only in right triangles. So, this only applies to right triangles. Before using this, we have to come to the conclusion that these two are right triangles. And normally it comes from knowing that we have right angles. You might be given that these two have right angles or one side is perpendicular to another side forming right angles. We have to come to that conclusion. After we prove that these are right triangles, then we can use hypotenuse-leg. In your proof statement, you will have to come to a point that these are right triangles. I want to reiterate this. Then all we need to know is one hypotenuse is congruent to the other. For example, . We only need to show that one set of legs is congruent. Either pair will work. You just need to know that one pair of legs is congruent. From here, let’s identify this and how they’ll match up. Let’s just make sure everything matches up. Now we have by hypotenuse-leg.